I have to confess the nearest I got to this tower house was the view from the R639. 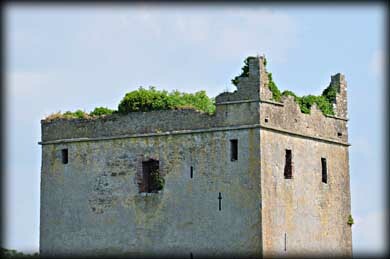 The tower appears to be five storeys high with traces of Irish Crenellations on the southeast corners. The few windows I did manage to see appeared quite small but there was a large number of defensive loops. 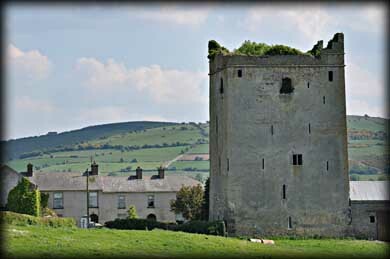 Prior to the middle of the 16th century the castle was held for the Earls of Kildare. It later passed to the hands of the Butlers who placed it in the care of the Graces from Foulkscourt. The tower house was temporarily vacated in the 17th century. Situated: I took exit 4 from the M8 and turned left for Johnstown. Glashare is located north of here on your right. Discovery Map 60: S 3251 7089. Last visit June 2013.